The initiative that launched Walkerswood Caribbean Foods is rooted in the rich history of community action, which has characterized Walkerswood village from the 1930’s. Following the nationwide riots of 1938 for better working conditions, a partnership emerged between Alton Henry, Peter Hinds and other village farm workers, Thom and Rita Girvan, engaged in the Government’s Social Welfare programme and Minnie and Fiona Simson of the Bromley Great House. Together they formed the “Pioneer Club” in 1940 on three acres of land. 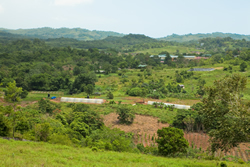 Out of this grew the Lucky Hill Co-operative Farm, the first registered co-operative farm in Jamaica. This partnership was formed at regular prayer meetings in the community. In 1999 Professor Norman Girvan, Thom’s son, in his speech at the company’s 21st anniversary celebrations recalled the critical role of religious faith in bridging the gap between the materially privileged and the materially less privileged in Walkerswood. In the 1970’s community councils were formed island-wide including the Walkerswood Community Council. It set itself four major objectives: (1) The building of a community centre (2) The provision of drinking water for everyone (3) Improving the Basic School (4) To provide employment for the community members. 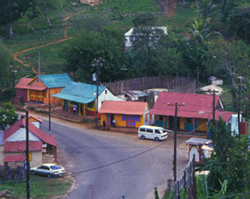 An employment committee was formed which worked towards the formation of Walkerswood Caribbean food Limited (then Cottage Industries) and other village enterprises. In 1976, with the assistance of the Jamaica Industrial Development Corporation, Walkerswood Caribbean Foods embarked on its first project of “Jerking” pork which it sold to local bars. Jerk pork is a firm local favourite and many villagers reared pigs in their back yard. Two people were employed and the company’s objective was to ensure that everyone in the community who wanted to work could get a decent job. In 1983 the company decided to bottle its Jerk seasoning for sale in local retail shops. This led to many letters from abroad requesting the product and in 1986 the company became the first Jamaican exporter of Jerk Seasoning. Today, our community link remains strong, we employ over 80 staff from the village, who are all essential in producing our excellent, high quality seasonings, spices, sauces and condiments and share our pride in what we offer to the world. As a further commitment to our community, our farmers – Walkerswood Co-operative Pepper Farmers Association - and the environment we utilize the “grey” water from our production facility and naturally filter it through reed beds via a number of ponds and supply pumped irrigation water onto the Co-op farms at no cost to the farmers. We also have a Pepper seedling nursery programme where we cultivate pepper seedlings which are then provided to the community farmers to assist and ensure we have a steady supply of fresh produce. Currently over 85% of our production is exported all across the Globe, with major distribution in USA, Canada, UK, New Zealand and select Caribbean islands. We remain committed to providing quality Caribbean food to all five continents…ENJOY!